Mr. Baker Kuwait, last updated on 27 March 2019 , is listed under the categories: Cakes, Chocolate, Bakeries. It was added to Kuwait Directory Rinnoo.net on 5 March 2016 . Pages of Mr. Baker Kuwait on Rinnoo.net have achieved 376,012 views till now. 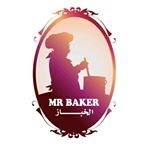 Mr. Baker company is one of the brands that fall under Mr. Baker's group range in addition to Alkanafani «Harvey» series of fast-food and «Mr. Subs & Wraps». Mr. Baker's group is also specialized in yachts Moi Marin, as the group is the exclusive agent for Energy Drink Real Port official drink for Real Madrid. There are about 22 branches of the Mr. Baker chain in Kuwait, so in less than 14 years since the launch of the brand in addition to the first branch outside of Kuwait in the city of Alexandria in Egypt. Who works in the group are nearly a thousand experienced employees, high efficiency, including 550 specialized employees to Mr. Baker's brand only. * Most viewed out of 23 branches. Sorted based on branches' views in the last 30 days, from Wednesday, 20 March 2019 till today.